Summary: About as close as you can get to the real deal without paying hundreds of thousands of dollars. Pros: Bright and super smooth tone, and sustain that’s absolutely to die for! This guitar is everything I imagined a ’59 Les Paul to sound and play like. Sounds and plays better than any Gibson re-issue I’ve ever played. 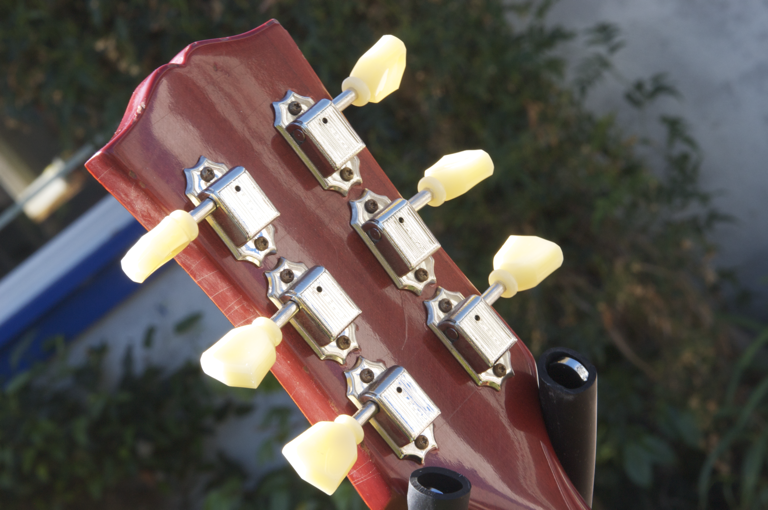 The first thing you’ll notice in the review is that I didn’t name the luthier of this guitar. 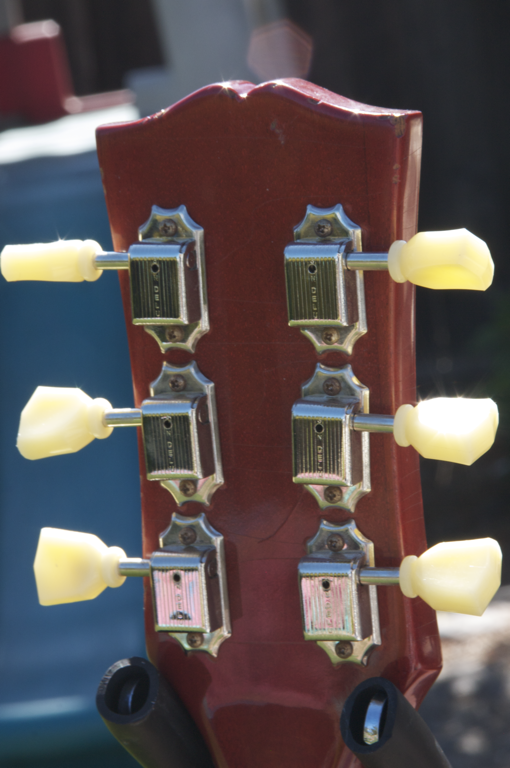 That’s because I didn’t want to “out” the luthier, lest Gibson finds out and sues them for copyright infringement; that’s how close these replicas get to the original. But despite the risk of litigation, there’s an incredibly active underground market for these replicas, and having played around with this one for a few days, I don’t think that market will ever die. BTW, if you want to know who the luthier is, just send me an e-mail (goofydawg “|” guitargear.org), or if you’re on TGP, send me a PM. 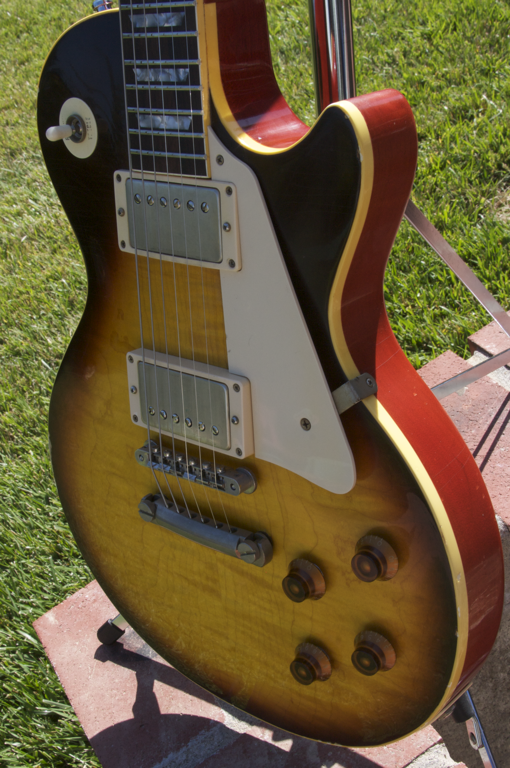 Besides, replicas like this put Gibson back on the relevance map. 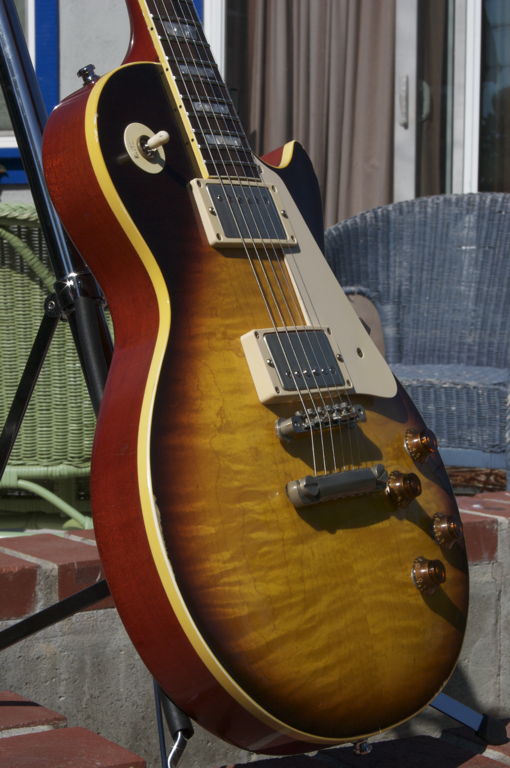 Can you say Slash and GnR’s “Appetite for Destruction?” Whether or not Gibson likes it, the replica that Slash played made the Les Paul popular among guitarists again. Forget how close it may come to the sound, feel, and dynamics of the original. Playing this guitar is like a religious experience! With this particular model, the original owner had the neck slightly tapered near the heal to relieve some of that “baseball bat” girth. It worked marvelously! Combined with the PLEK treatment, this guitar is absolutely easy to play. I usually have to take a few days to get to know the feel of a new neck. I even had to do this with my beloved Gibson Nighthawk. But with this guitar, I felt right at home! Weight-wise, it has some heft at 9.6 lbs., but it’s so comfortable, and once I started playing, I completely forgot about the weight. Pictures courtesy of Bennie Delumpa (my son). As you can see from the pictures, the guitar has been lightly relicked. I’m not normally a fan of aging a perfectly good guitar, but the purpose behind the aging was to produce a guitar that looked like a well-taken-care-of guitar from 1959. It has a couple of nicks on the binding of the body, and the lacquer has been very, very lightly checked. But other than that, it’s gorgeous. Unfortunately, my studio is still in a bit of disarray after the construction I had done on my house, so I don’t have my usual sound clips. But all I can say about the tone of this guitar is that it is nothing short of spectacular. The tone is on the brighter side of midrange, but the guitar produces all sorts of overtones and harmonics. 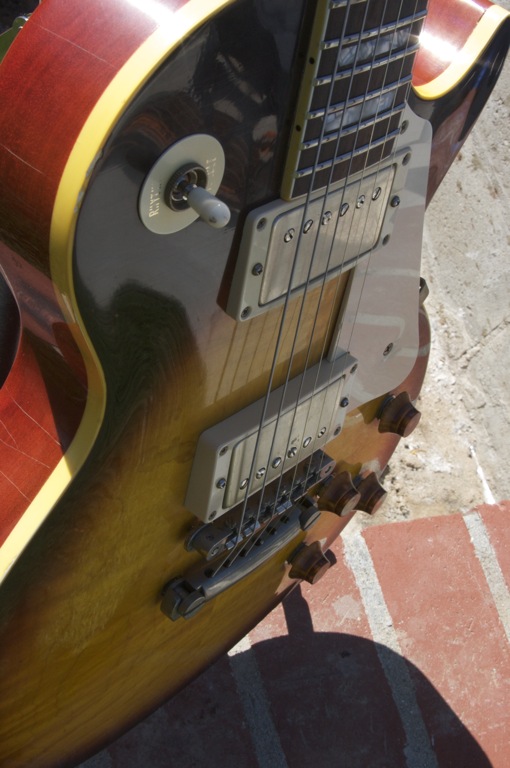 The pickups used in the guitar are not hot at all, but that just makes it real smooth. 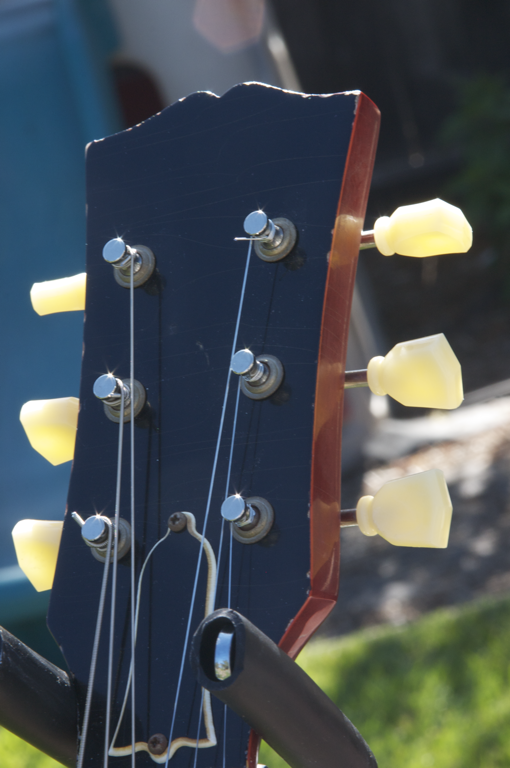 Another thing is that the cap values used for the tone knobs make them quite usable. You can really knock the tone down, and the tone will not muddy up. I love that, as it gives me that much more tone shaping capabilities that I can do right at the guitar, as opposed to doing it at the amp. 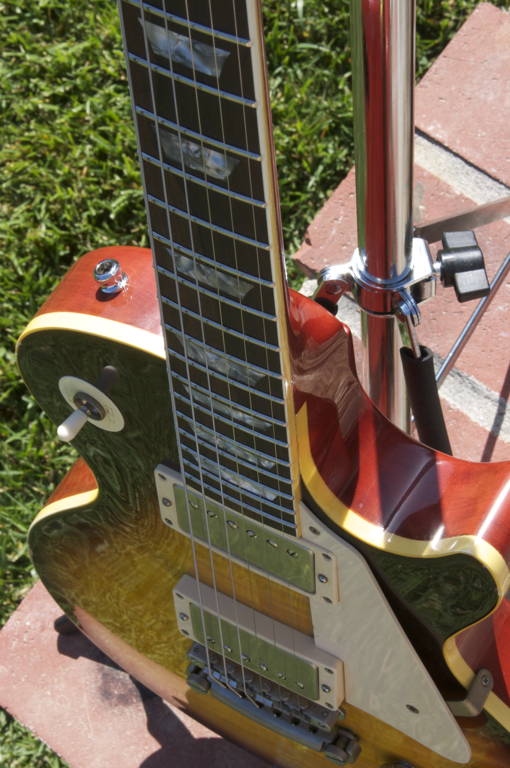 The guitar also sports the classic Les Paul “bloom” as the body resonates, and boy does it resonate! Pluck a string, and you get your note, and then the body starts resonating, and you can hear AND feel the swell of the string vibrations as they course through the tone woods. I just close my eyes and go off to Never-never land. There’s a lot to be said about old growth wood that has been drying for 50 years. 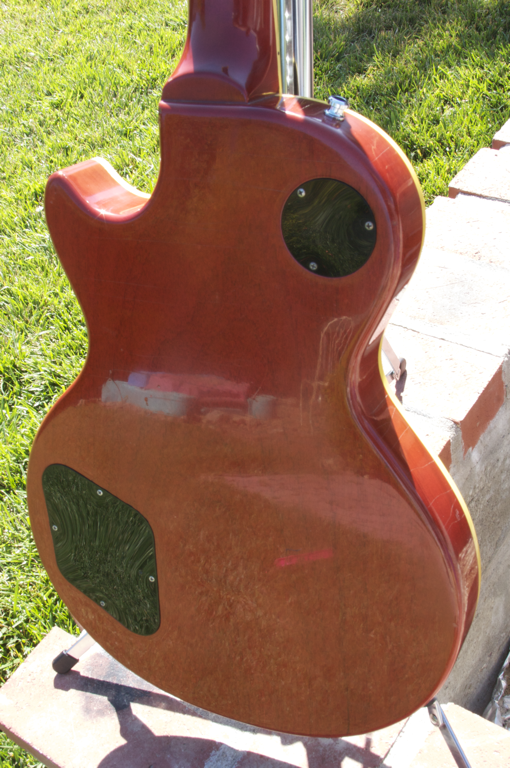 Jeff Aragaki, who is quite knowledgeable about Les Pauls (he has many) is convinced that the combination of materials (old growth woods, hide glue, nitro-cellulose lacquer, correct hardware, etc.) that were used on this guitar make its sound that special. I really have never played a guitar that sounds and responds to like this! I was just thinking that once I do manage to get a recording of this guitar, it just won’t do justice to the feel and dynamics of this spectacular specimen. I’ll hopefully be able to capture at least some of what I’m talking about. As I said above, forget about how close it may come to the original. I’ve never played a guitar that felt and sounded as good as this. I’ve never played a real ’59, but this guitar just oozes Les Paul goodness, and it’s everything I believe a Les Paul should be! Great review. But, the reality is that it it totally useless for us mere mortals because you didn’t want to “out” the luthier. So, despite your good intentions is it is just really a huge tease for most of us. Kinda like the schoolyard where some kid says “Na Na I have one and you don’t.” Enjoy it! 🙂 I see what you mean. You can email me or PM me on TGP and I’ll tell you. A very detailed review. I especially like your review of the Mad Professor Deep Blue Delay. I just have a question/comment. 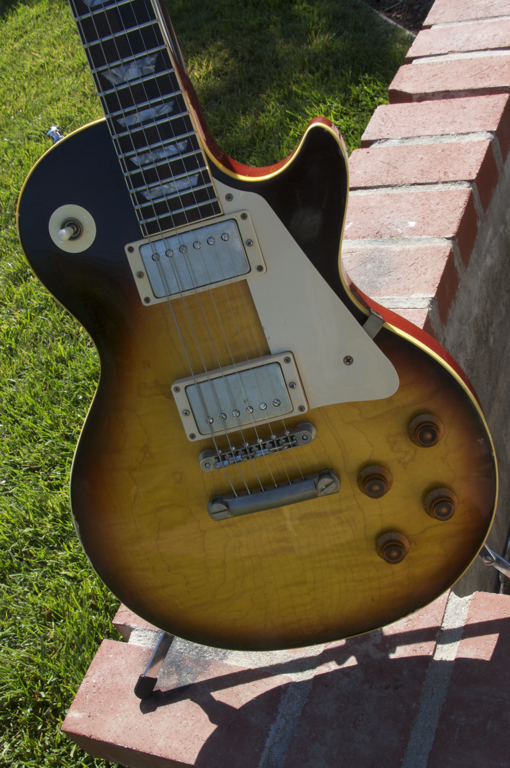 From what i have read, Gibson’s Reissue guitars are to die for, but their price cause people to stay away. The 1959’s price is very steep, and I don’t think I can pay that much, but I have found that there is a Reissue Called the 1957 Goldtop Darkback which can equally produce incredible tones. 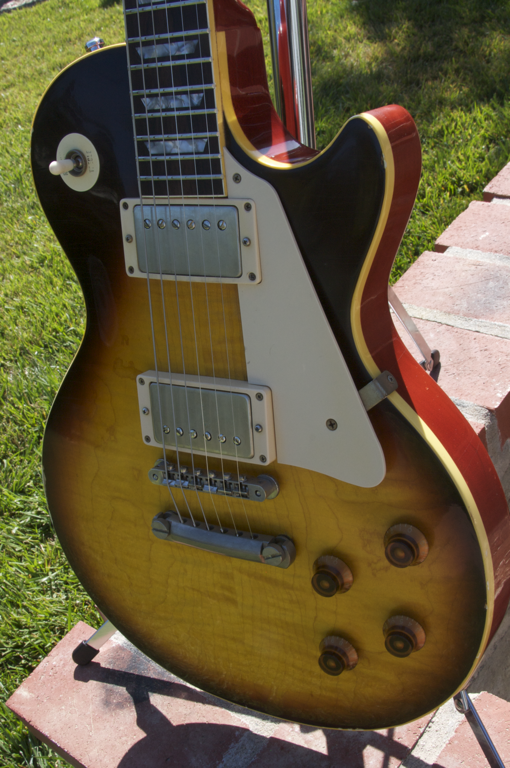 So, what are your thoughts when comparing the Gibson 1959 Les Paul Reissue and the Gibson 1957 Goldtop Darkback Reissue?